I am a Master Psychic, Clairvoyant, Empath, and Clairaudient. I was born with the ability as it was passed down from my grandmother who is a world renowned psychic. I've been a professional psychic for 17 years in Orange County, California. I have a Doctorate of Metaphysics and Divinity as well as certifications as a psychic healer, spiritual counselor, tarot card reader, and palmist (or palm reader). I have traveled through many countries researching various cultures methods of meditation, readings, and their knowledge of balancing ones self and spiritual well-being. I incorporate all that I have learned in my travels with my psychic gift, my spirit guides and angels, to give you the most detailed and accurate reading possible. I have been a guest on several tv and radio shows. I cater to high profile clientele. I am available for parties, corporate events and charity fundraisers. In the past, I have worked events for St. Johns clothing, Mac cosmetics, Louis Vuitton, Chanel, and many others. I am now making myself available to anyone that is seeking the truth. 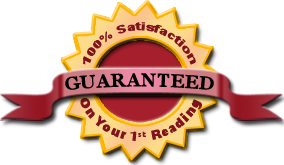 I offer a 100% Satisfaction Guarantee on your initial reading. If your reading is not accurate, I do not charge. I take pride in my accuracy. I will begin your reading by telling you about your personality, childhood, and up to your current situation. If we do not connect when I start the initial reading, which rarely happens, then your payment will be refunded. I do offer other cleansing / spiritual well-being services including chakra balancing, meditation, crystals, and candles. These services are available upon request or on an as needed basis. I will happily give you a price quote for the services you are interested in receiving. I do not offer readings by email as it is too impersonal. Readings must be done over the phone or in person. 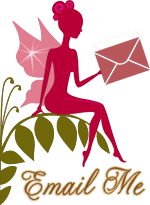 If you purchase a reading on my website before speaking with me, then an appointment will be set up within 24 hours. Readings are based on a first come, first serve basis unless you have a scheduled your appointment in advance. 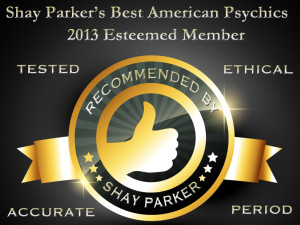 Shay Parker's Best American Psychics is a source for accurate, professional psychics and trustworthy intuitive guidance. Every psychic listed on Best American Psychics (BAP) has undergone two separate test readings for accuracy, legitimacy, professionalism, and more. Before being granted membership, every psychic must complete two separate test readings, each 30 minutes long. One is with a staff tester and the other is with a volunteer client. Best American Psychics is a limited, exclusive directory, granting only the most elite psychics a chance at membership.